Federal and state governments in the U.S. spend over $1 trillion on social services without measuring or tracking most results. Pay for Success provides an alternative to this status quo by enabling governments, nonprofits, and impact investors to enter into public-private partnerships that rigorously evaluate social service interventions so that only the highest-quality programs are expanded, and taxpayers only pay for what works. 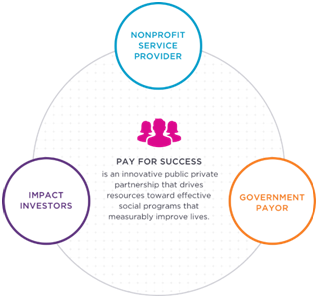 Pay for Success (PFS) is a growing field of outcomes-based impact investing that measurably improves the lives of people in need by driving funding to interventions and service providers that have proven results. PFS developed out of a need for a more flexible and evidence-based approach to providing social services to disadvantaged and vulnerable individuals and families. Currently, federal and state governments in the U.S. spend over $1 trillion on social services without measuring or tracking most results. PFS provides an alternative to this status quo by enabling governments, nonprofits, and impact investors to enter into public-private partnerships that rigorously evaluate social service interventions so that only the highest-quality programs are expanded, and taxpayers only pay for what works. To best understand how Pay for Success works, let’s walk through an example. PFS projects often begin with a policy priority, or a problem a government wants to address. In 2013, New York State launched its first Pay for Success project to improve public safety and reduce prisoner recidivism. High-risk individuals leaving the state’s prisons had a 70% likelihood of returning to prison within three years, at a significant financial and social cost to the state. 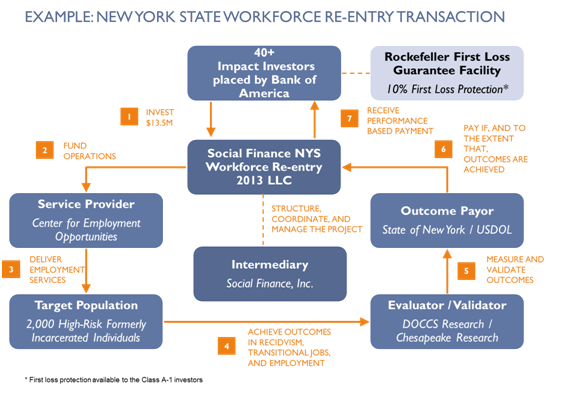 New York selected Social Finance to serve as the intermediary in a PFS project to address the State’s target outcomes: improving public safety and increasing employment by reducing recidivism. Social Finance conducted extensive due diligence to identify an evidence-based nonprofit to deliver services. Social Finance and New York selected The Center for Employment Opportunities (CEO), a nonprofit that operates an evidence-based reentry services model through life skills training, transitional jobs and job placement for individuals leaving prison. Through this PFS project, Social Finance, along with Bank of America, raised $13.5M of private investor capital from individuals, foundations, and financial institutions to fund an expansion of CEO to serve an additional 2,000 clients in New York State. Social Finance assisted New York State and CEO to set outcome targets before the project launched. If CEO’s intervention is able to reduce recidivism by at least 8 percentage points and increase employment by at least 5 percentage points compared to a control group over 5.5 years, then New York State will pay investors back their principal plus a return. This payment will come out of the savings the state realizes from these individuals holding down jobs and staying out of court, prison and the emergency room. On the other hand, if after that period these outcome targets are not met, the government owes nothing-an outcome that is a success unique to the PFS structure: identifying when a program is not working and why. Rather than using a typical “fee for service” model, New York State chose to use a PFS structure to lower the risk of investing in a preventative program, and ensure that taxpayer dollars are only spent when a program is truly effective at improving the lives of those in need. In October 2015, the project enrolled its 1,000th client, meeting the project’s first enrollment milestone ahead of schedule. Interim outcomes of recidivism reduction and employment for the project are expected in 2017.
Who benefits from a Pay for Success project? First and foremost, people in need who receive high-quality services. These services help them live healthier and more productive lives-by avoiding prison sentences, finding gainful employment, or better managing their health. Second, the service provider(s) benefit from up front, flexible funding. This funding enables them to develop and expand effective interventions to serve more people in need. The rigorous evaluation of their intervention that is key to the PFS structure provides an evidence base from which the service provider can acquire future contracts and scale further. Third, the government (or outcomes payor) benefits from an efficient, cost-effective, low-risk solution to addressing some of their residents’ most pressing issues. By shifting the risk of paying for programs that don’t improve lives to impact investors, government is able to invest in innovative preventative services without putting taxpayer money at risk. Lastly, impact investors benefit from investing in their communities and supporting high-quality programs. These investors range from financial institutions, to insurance agencies, to foundations, to community development financial institutions (CDFIs). All share in the ultimate goal of achieving both a financial and social return. For many investors, the recycling nature of PFS investments amplifies the impact of their organization with the same valuable dollars. Why are commercial banks and private investors interested in Pay for Success? Pay for Success is unique in its appeal to a wide variety of investors who are drawn to the metrics and data-driven nature of PFS projects. While invested capital is at risk and the model is relatively untested, investors are able to perform thorough diligence on the intervention and service provider. They are attracted to the Pay for Success model because it offers a uniquely direct form of impact investing-life improvements are the source of investment returns. In addition to the direct financial and social returns that attract non-traditional investors, Pay for Success is attracting interest due to its disruptive approach in creating a new form of philanthropy. Impact investors that choose to participate in Pay for Success deals understand the innovation and promise of this new funding model, and want to take part in expanding the market. The essence of Pay for Success is about changing mindsets, and bringing uncommon collaborators together from different sectors, geographies, and backgrounds. All with the goal of creating a more effective approach to solving society’s complex issues-a goal that attracts investors of all kinds. What does the pfs market look like now? How might it change in the future? When Social Finance began five years ago, Pay for Success financing was a very new concept in the U.S. Social Finance’s sister organization, Social Finance U.K., had just launched the world’s first Social Impact Bond. Since then, Pay for Success has gone global-twelve countries have launched over 50 projects worldwide. The power of the PFS model spans across borders, issues, policy contexts, and sectors. The ten Social Impact Bonds that have launched in the United States to date are expected to serve approximately 18,000 people in the coming years. While this is a positive trend, this scale is clearly not enough to move the needle on many social issues. The current complexity of structuring Pay for Success projects has impacted the speed of the market’s growth. The future of Pay for Success and the expansion of the market will depend on the ability of those involved to streamline the project development process, and to provide flexibility in finding innovative ways to reach scale. Pay for Success has the power to substantially change the role of capital markets in our society and to create a better functioning social economy for the betterment of us all. To this end, Social Finance is committed to doing its part to drive the growth and evolution of the Pay for Success market-providing new opportunities to put capital to work for those most in need. *Social Finance is a 501(c)(3) nonprofit organization that mobilizes capital to drive social progress. As a PFS intermediary, they design and manage public-private partnerships that tackle complex social challenges, such as achievement gaps, health disparities, and prisoner recidivism. Core to their work is the development of Pay for Success financing, also referred to as Social Impact Bonds. Click here to learn more about what they do.